Holiday in Prague? We are here for you! 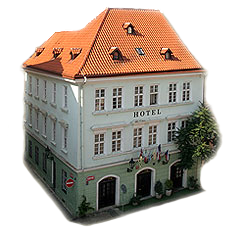 The Betlem Club Hotel in Prague 1 is located in quiet Bethlehem Square in the historical center of Prague. Just a 5 minute walk from Charles Bridge and Old Town Square, it provides an ideal opportunity for walks in historic Prague and excursions in culture and shopping. If you want to learn more about where to go in Prague and what is happening interesting, check out our Virtual Concierge of Prague. For your holiday accommodations in Prague we offer 21 beautiful rooms, equipped with stylish furniture complementing the historic atmosphere of the hotel. Each room has a refrigerator, satellite TV, a telephone for direct calls worldwide and a bathroom. The bathrooms have a bath or shower, hair dryer, WC, cosmetic accessories and hand and bath towels. Along with a great location, the hotel is admired for its excellent breakfast served in a 13th century Romanesque-Gothic cellar. The hotel has free Internet access and during your stay you will have access to a wide range of hotel services and our friendly staff will make sure that you have enjoyed your stay in comfort and ease.